In the annals of history, the scrappy fight betwixt the megaliths of e-reading and their respective tablet progeny will yield an underground victor. Much like the sleepy hacker hit that was the Nook Color, Barnes and Noble's big bro tab looks to be carrying on that legacy of unapproved use and this time there's a lot less microSD card swapping required. In fact, there's none needed at all, as the barrier for entry here is super low. All it takes to sidestep B&N's app store for a host of third party options (like Amazon's App Store shown above) is the tab's own browser. Yes, it's almost that simple and also kind of hit or miss. See, once you attempt to install an application via the web, a previously hidden settings menu should pop up asking for permission. Grant the slate access, find the app in your download queue, re-install it and, presto magico, it'll work and then... vanish from your homescreen. But don't fret, the app's still there, you'll just need to search for it using the "n" hardware button. Confused? Excited? Unsure of how to feel? Why not just give it a go and report back in the comments below. 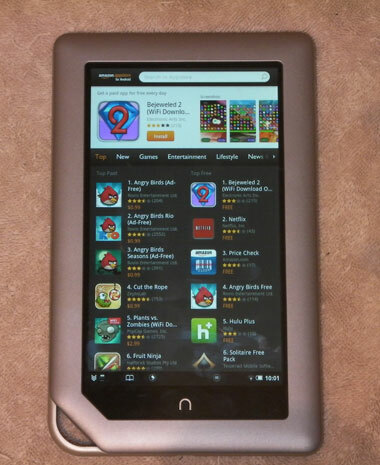 Nook Tablet forgets to use protection, lets outside apps in originally appeared on Engadget on Thu, 17 Nov 2011 17:08:00 EDT. Please see our terms for use of feeds.